In an ideal world, every power adapter would be an in-line brick with its plug on the end of a pigtail. 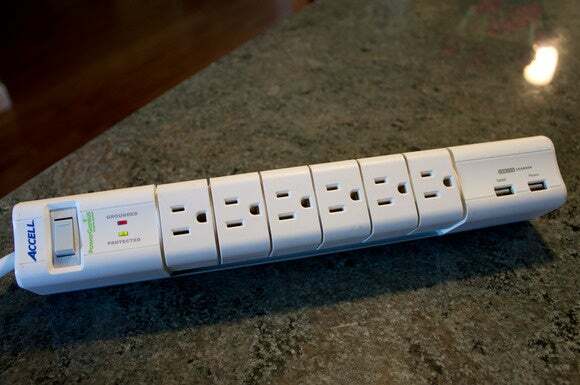 Until we realize that world, Accell’s PowerGenius surge protector might be the next best thing. It seems like no matter how the outlets on the typical outlet strip are oriented, you always wind up with one or more adapters blocking an adjacent plug and rendering it useless. Not this one. 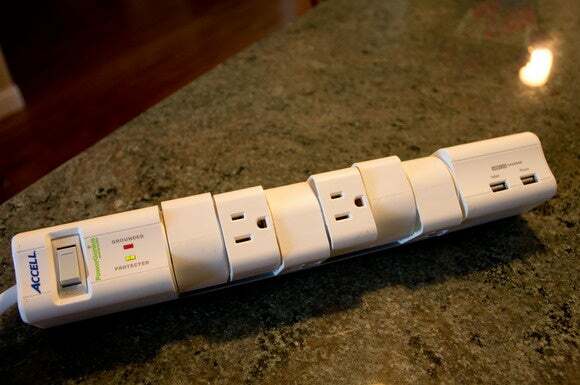 Each of the PowerGenius’s six outlets rotates 180 degrees so that no matter how large of a wall wart you plug into it, the next outlet won’t be blocked. In addition to its six outlets, the strip has two USB charging ports that can deliver 5 volts and 2.4 amps directly to a USB device—no adapter needed. The two ports share that power, however; the port labeled “tablet” can deliver a maximum of 2.4 amps, while the port labeled “phone” can deliver a maximum of 1.0 amps. Plug in two phones that draw 1.0 amp each, and the strip can charge both at full speed. Plug in a phone drawing 1.0 amps and a tablet drawing 2.4 amps at the same time, and Accell estimates the strip will charge both devices 55 percent as fast. If you don’t need the USB feature, Accell also offers a less-expensive model that has 7 outlets but no USB ports. I was able to use all six of this surge suppressor's outlets, even though I had several oversized power adapters and one battery charger. The rest of PowerGenius’s features are pretty standard fare: The strip comes with a six-foot grounded cable, and it has a red LED to indicate when it’s properly grounded and a green LED to indicate when it’s delivering active protection. It’s equipped with a 15-amp circuit breaker that will shut the power strip down if a connected device malfunctions or total power draw exceeds its 1800-watt capacity. The MOVs (metal-oxide varistors) that enable the PowerGenius to protect connected devices from power surges are encased in a fireproof material that prevents them from igniting in the event of a massive power surge. Once the strip is no longer capable of absorbing power surges, it will cease to conduct power to its outlets to protect connected devices. The Accell PowerGenius has six usable outlets, plus two USB charging ports. The PowerGenius is a pretty terrific surge suppressor, but two features found on the Tripp Lite TLP606DMUSB would make it even better: A set of sturdy clamps to secure it to the edge of your work surface, and locating the master toggle switch on the end of the strip—where the power cord emerges—instead of the top. The switch is somewhat recessed in its present location, but I did depress it unintentionally and turn the strip off while I was plugging a power adapter into the closest outlet. I can’t say those two criticisms are more important than the rotating outlets, however; they’re a fabulous idea. 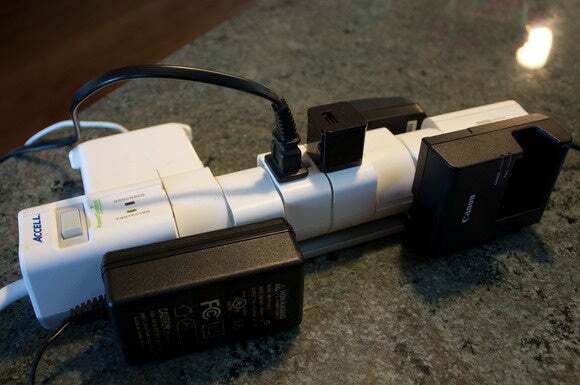 This surge-protector's rotating outlets are its primary claim to fame; it's an ingenious solution to the common problem of one power adapter blocking adjacent outlets on the strip.